BMW introduceda caravan trailerat the CES in Las Vegas . The dwelling is made of fabric and carbon fiber and was developed in collaboration with outdoor specialist The North Face . 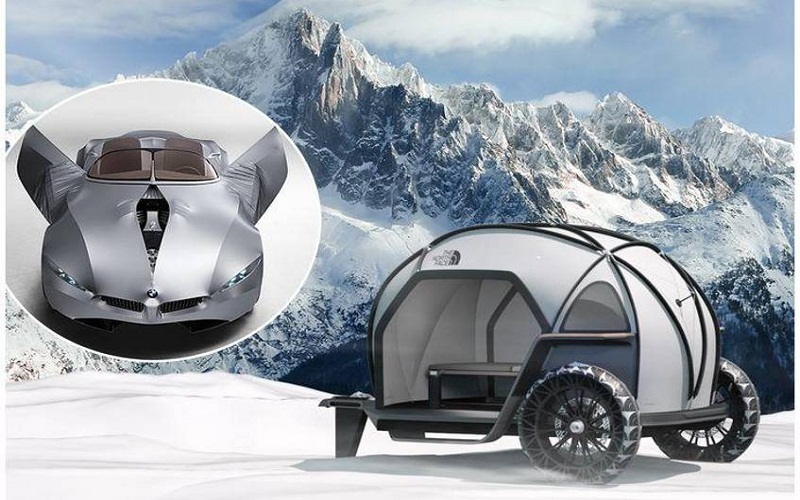 Futurelight names BMW and outdoor equipment supplier The North Face their joint development: a small caravan that looks like a tent with a rear axle . The frame of the vehicle is made of carbon fiber , a material with which BMW has a lot of experience thanks to its i3 and i8 models, some of which are made of this lightweight material. The frame is covered with a fabric called futurelight fabric. The fabric should protect from wind and be waterproof but breathable. Fabrics with such properties have been around for decades – one of the best known representatives of the garment sector is that of the US company WL Gore& Associates developed Gore-Tex. The material woven by so-called nanospinning is nothing less than “the most advanced in the world” for BMW and The North Face . It should defy even the coldest conditions. Lots of space is lost in the Futurelight caravan for the wide rear fenders and the equally wide running boards. Nevertheless, two people should be able to lie next to each other in the tent. Just above the bed is a bench that can also serve as a table. When looking into the interior, however, the suspicion arises that the sleeping must lie flat on their backs so as not to hit the bench. Triangular windows in the rear let light into the tent and the two side walls can be completely removed by zipper. Instead of a support wheel, the Futurelight carries only one carbon fin. Futuristic are also the wheels of the lightweight caravan: large coarse-spoke wheels without pneumatic tires. Such wheels have hitherto only been known from fairs as future studies. About the weight and possible towing vehicles make both manufacturers no information. One picture shows a control unit for VR glasses (VR: Virtual Reality) – so far the Futurelight seems to be just a computer model. In connection with the presentation of the Futurelight caravan, BMW refers to his study Gina Light Vision ( Gina : geometry and functions in N-fold form). Completed a long time ago, the concept car was unveiled in 2008 for the reopening of the BMW Museum. The mobile study is covered with a stretchy silver fabric – and is similar to a Z4 E89 series (2002 to 2008.) The revolutionary fabric technology of the study has not reached a series status – it could be similar to the tent caravan. The fabric developed for the trailer, however , The North Face would like to offer in his upcoming fall collection.